Throughout this series, I have made it clear that I am not a master of these arts, and that my experience with enameling was limited to a brief “career” spanning the years 1983 to 1988. I would like to end the series with examples of true masterworks and other notable enamels, from both long ago and the more recent past. With these examples, I would like to make the reader aware of the very long history of the art form, the high level of skill and talent devoted to it through the ages, the brilliance and beauty it can attain, the diversity of techniques, and the durability of the pieces created. Note: Numbers in parentheses shown beside pictures refer to the Photo Credits list at the end of this posting. The leading role in this posting goes without question to one of the oldest known enamel works, a dagger from the Mycenaean period in Greece, 15th Century B.C., decorated with cloisonné enameling. This was the era that, in the belief of many, somewhat later saw the Trojan War and such heroes as Achilles, Odysseus, Hector, and Aeneas. The durability of enamel is immediately apparent – a fresh surface seemingly from the recent past, contrasting with the severely corroded blade that shows the weathering of well over three millennia. The Holy Crown of Hungary (also known as the Crown of Saint Stephen) features one of the best known collections of enamel masterworks in the world. It was the coronation crown used by the Kingdom of Hungary through most of its existence; more than fifty kings have been crowned with it since the 12th century, up to the last in 1916. The enamels on the Holy Crown are mainly or altogether Byzantine work, presumed to have been made in Constantinople in the 1070s. The crown has probably been remodeled, and it uses elements of different origins. 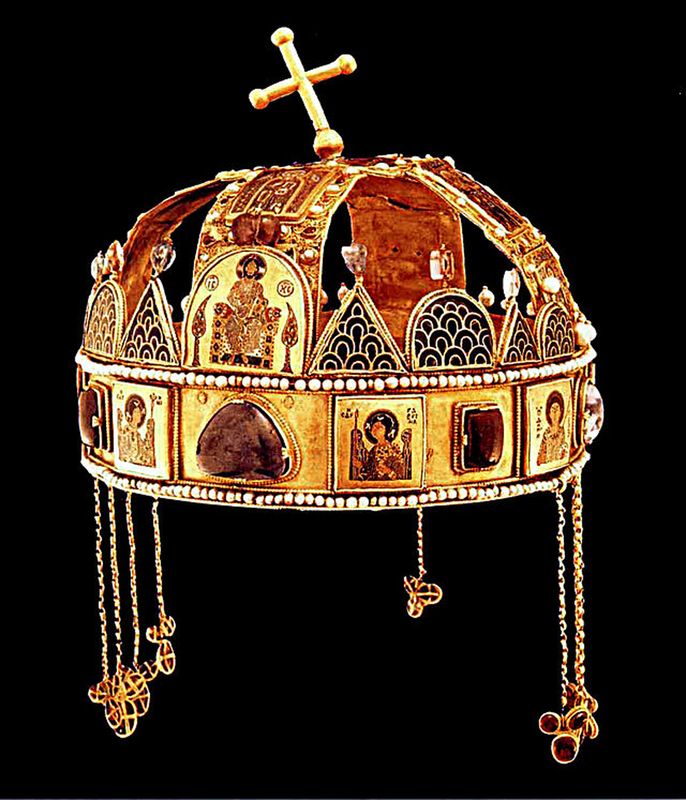 The date assigned to the present configuration of the Holy Crown varies, but is most commonly put around the late 12th century. The cross was knocked crooked in the 17th century when the crown was damaged, possibly by the top of the iron chest housing it being hastily closed without the crown having been placed in it properly. The cross has since been left in this slanted position. Following are details of two enamels on the crown, the Greek (1a) and the Latin (1b) Pantokrators. “Christ Pantokrator,” or “Christ the Almighty,” is one of the first images developed in the early Christian Church, and remains as a central icon of the Eastern Orthodox Church. 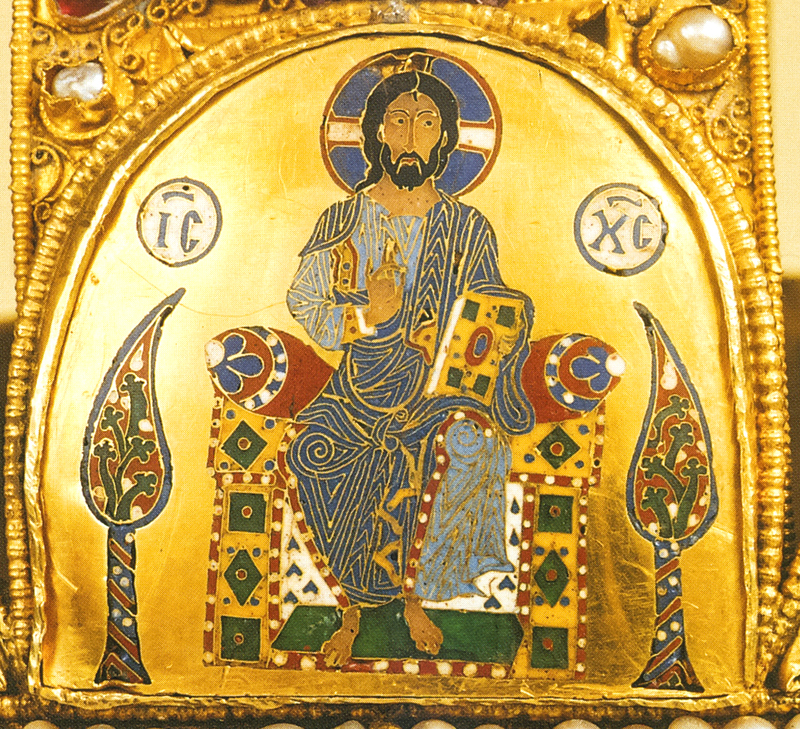 The Greek enamel is mounted on the front of the crown, and the Latin at the top of the crown, where the bent cross can be seen from center to left center. 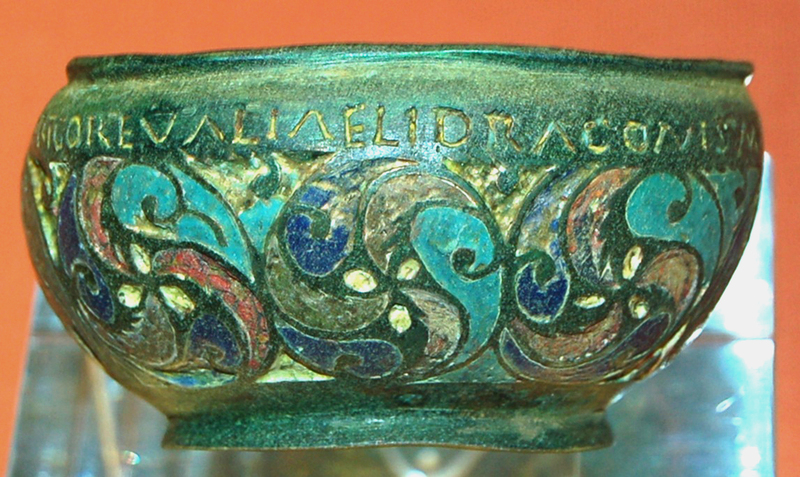 A much older piece, known as the Staffordshire Moorlands Pan, is of enameled bronze. It dates from Roman Britain in the 2nd Century AD, and was found in a very well preserved condition with intact enamel inlays. It is inscribed with the name Aelius Draco and the names of four forts on Hadrian’s Wall: MAIS (Bowness-on-Solway), COGGABATA (Drumburgh), VXELODVNVM (Stanwix), and CAMMOGLANNA (Castlesteads). 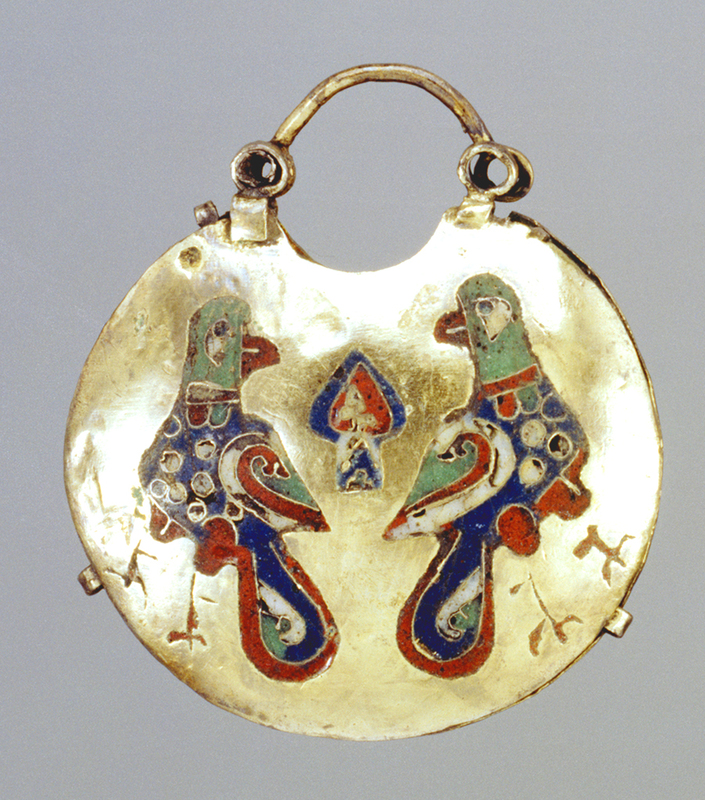 The shoulder-clasp below is from the 7th century AD Anglo-Saxon ship burial at Sutton Hoo, U.K. It is classified as Migration Period Art, denoting the artwork of the Germanic peoples during the period of about 300-900 AD. A champlevé casket, believed to be of North German origin during the period 1100 to 1150 A.D., is shown below. By the 14th century, the cloisonné technique had spread to China, where it is still in common use. The Chinese applied it to much larger vessels, such as bowls and vases, than had previously been done elsewhere. 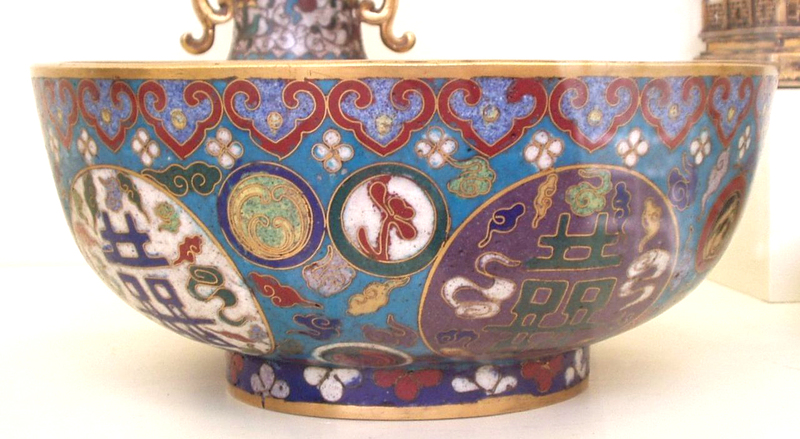 The bowl shown here, using nine colors of enamel, was made during the Ming Dynasty, 1368 to 1644. 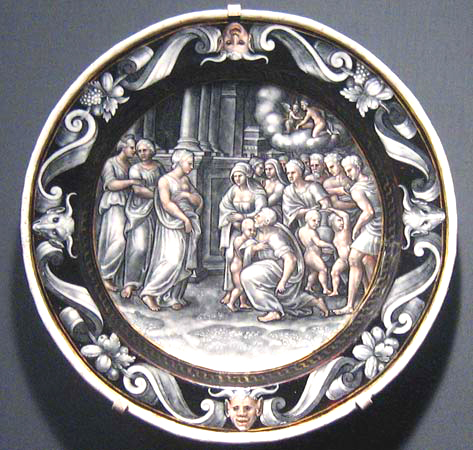 The following plate, The Adoration of Psyche by Pierre Courteys, 1560, is an example of the grisaille technique, previously discussed. Color was added using the limoges technique, which has not yet been described in this series. Finely ground enamel was mixed with oil to form a paste that could be manipulated much in the fashion of an oil paint, achieving subtle gradations of color and shade. The next piece is a “vinaigrette” by an anonymous Swiss artist, dated about 1805. Vinaigrettes, also known as smelling salt containers, had become fashionable in about 1800. They were small containers fitted with a pierced inner lid that contained sponges drenched with scent or perfume. 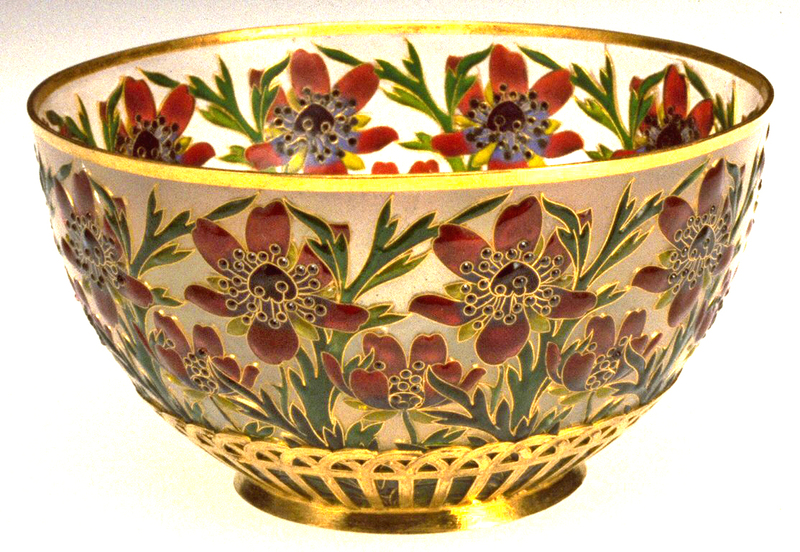 Typical cloisonné patterns can be seen on top and around the middle of the piece. Elsewhere, the delicate flower paintings suggest the use of the limoges technique. The artist’s skill can best be appreciated with the information that the diameter of the piece is 1.1 inch. In the late 19th and early 20th centuries, Russia played a prominent role in enamel art. 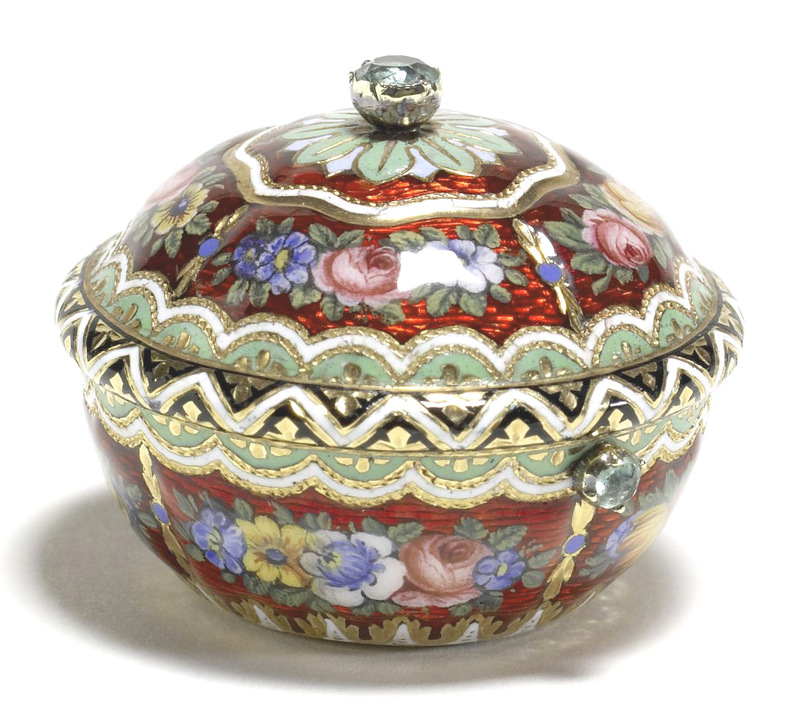 By far the best-known name in Russian enamels was the House of Fabergé. This firm was commissioned by two successive Tsars, Alexander III and Nicholas II, to make artworks as gifts to their empresses and, in the case of Nicholas, to his mother as well. Carl Fabergé had freedom of design provided that the artwork was based on an Easter egg, and that there was a hidden surprise within the egg. This practice started in 1885 and became a tradition lasting until the Bolsheviks nationalized the House in 1918 and the Fabergé family fled. Fifty-four Imperial eggs were completed, of which 42 have survived. Illustrated here are four that are particularly noteworthy for their creative use of enamels, particularly in the grisaille and limoges techniques, in combination with highly decorative metalwork. The final piece in this series was made using a technique not previously mentioned, known as plique-à-jour (“letting in daylight”). All or nearly all the enamels used in such a piece are transparent or translucent. In this particular piece, Cup with Poppies, made in 1903 by the French artist André Fernand Thesmar, cloisonné wires were assembled on a temporary base to form cells that were then filled with layers of enamel and fired. In an alternative plique-à-jour procedure, pockets similar to those of the champlevé technique, but piercing the entire metal sheet, are created by any suitable means – etching, drilling, sawing, etc. A temporary backing plate is then attached. In both the above cases, the temporary base or backing plate serves as a floor to hold the enamel in place during packing and firing. Afterward, it is removed and discarded. Depending on the shape and needs of the piece, the temporary item may be of metal to which enamel does not adhere, or of mica, so that it is easily removed by tapping. Or other means of removal, such as by a mordant or by abrasion, may be employed. The final effect is that of a miniature stained-glass window. This technique is laborious and slow, and it has a high failure rate. Many pieces have not survived because of their extreme fragility. The technique originated in the Byzantine Empire in the 6th century A.D.
(0) Dagger with cloisonné enamel, Mycenaean, 15th Century B.C. Museum of Athens. (1) Crown of the king of Hungary at the Dome hall of the Parliament building, Budapest, Northern Hungary. 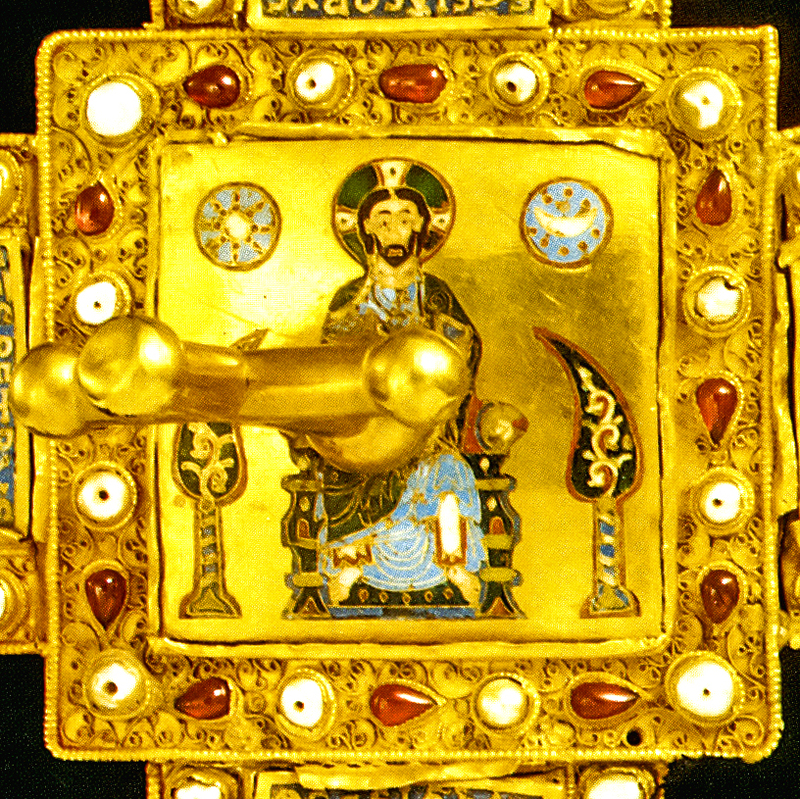 Including (1a) The Greek Pantokrator on the Hungarian Holy Crown, and (1b) The Latin Pantokrator on the top of the Holy Crown. (2) Staffordshire Moorlands Pan (1284837406) by Portable Antiquities Scheme from London, England. Photo by Dominic Coyne, Young Graduates for Museums and Galleries programme, August 2007. 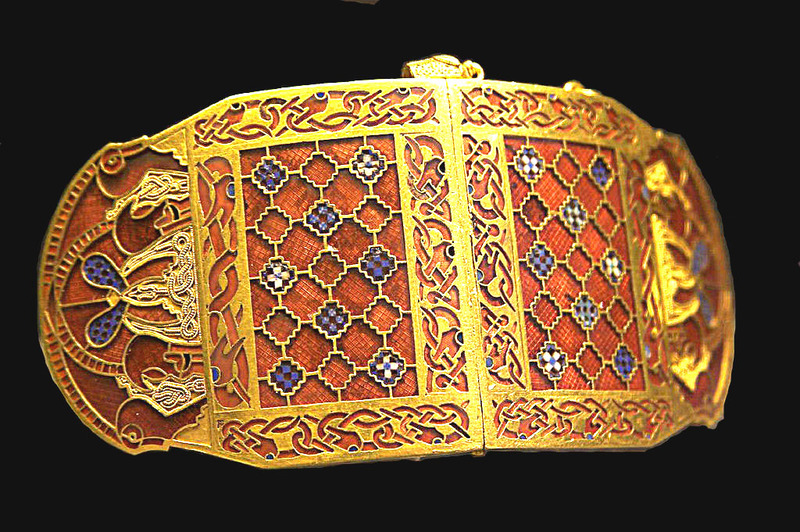 (3) Sutton Hoo Shoulder Clasp. Rob Roy. From the 7th century Anglo-Saxon ship burial at Sutton Hoo. British Museum. 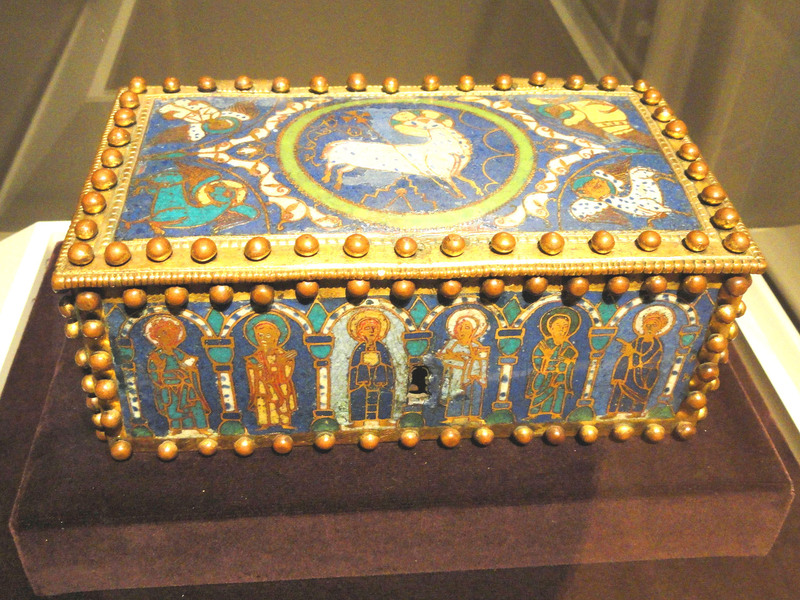 (4) Champlevé Enamel Casket, perhaps 1100-1150, perhaps North German, Gilded copper and enamel. Cleveland Museum of Art. 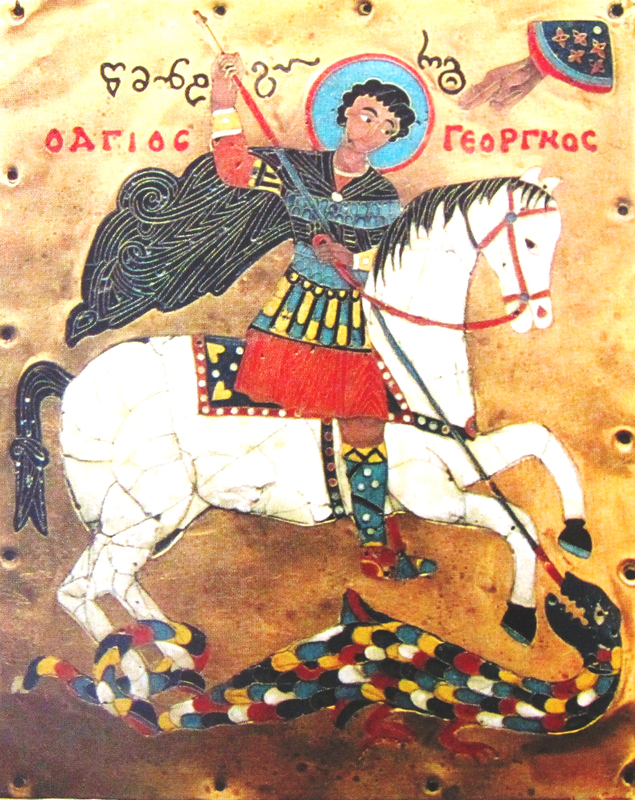 (5) St. George slaying the dragon. Georgian, 15th Century. Georgian State Museum of Fine Arts. (6) Temple Pendant (Kolt) with Two Birds. Ukrainian, 12th Century. Walters Art Museum. (9) Vinaigrette. Swiss, anonymous, about 1805. Walters Art Museum. 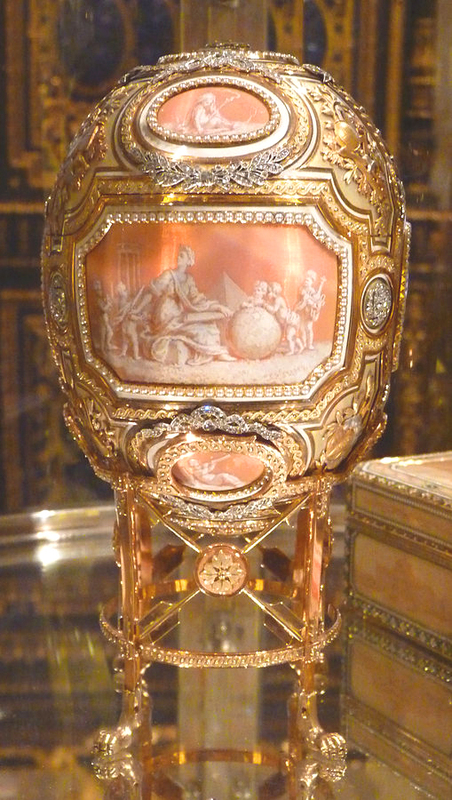 (10) Catherine the Great, Fabergé Easter Egg 1914. Hillwood Estate, Museum & Gardens. 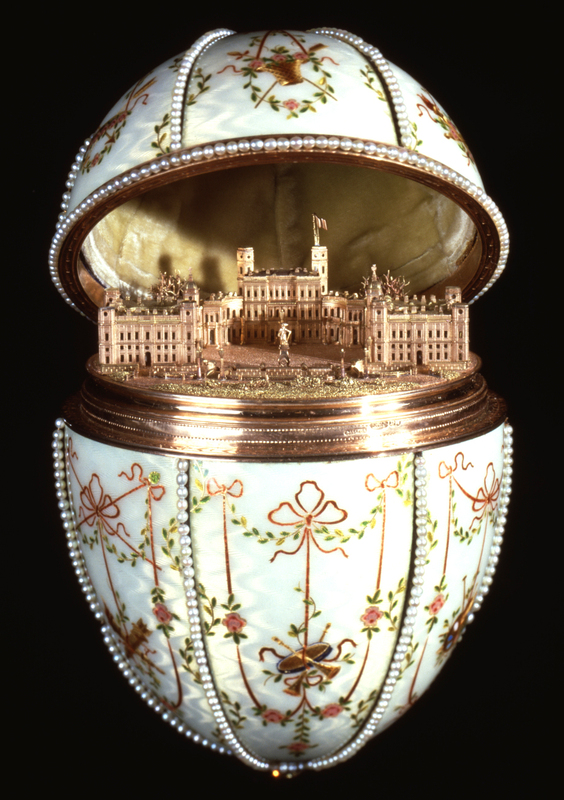 (11) Gatchina Palace, Fabergé Easter Egg 1901. Walters Art Museum. 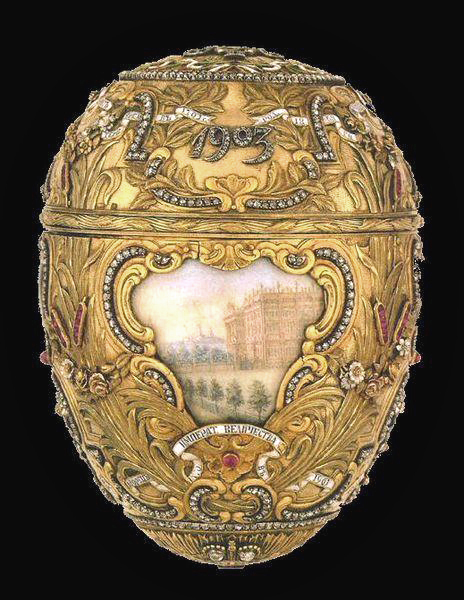 (12) Peter the Great, Fabergé Easter Egg 1903. Virginia Museum of Fine Arts. 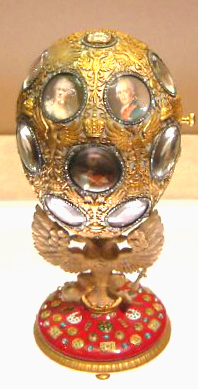 (13) Romanov Tercentenary, Fabergé Easter Egg 1913. Kremlin Armoury. (14) Cup with Poppies, by André Fernand Thesmar, 1903. Walters Art Museum.